The Pink Peony is a variety of peony that is outstandingly impressive. Bold by shape and understated by color, it is like holding the memories of cotton candy and ice cream rendezvous at a moment's glance. These double bloom florets are over-bursting with sweet pink-colored petals that evoke decadence and prosperity due to the sheer magnitude of their corpulent blossoms. 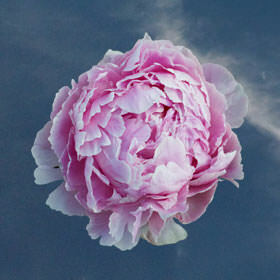 One thinks of the flowing skirt of a ballerina when seeing a Pink Peony, after all, it is an ethereal delicacy. Like all things that are too good to be true, the Pink Peony will have you in absolute disbelief, their splendor is not of this world. And yet we have the joy of sharing them with you, this heavenly experience is not be not to be missed or ever forgotten! If you are looking for a gift that is stunning and unforgettable, these blossoms surely are it. Feminine and romantic, they are the epitome of luxury. These globe shaped blossoms certainly have a lot of coy complexity with their tones of pink that fade into soft blush, intertwined with a creaminess that is sometimes flecked by accents of scarlet like a quick and light paint stroke. Group these flowers for a gorgeous bouquet that is nearly edible. Congratulate someone special in a way that will surpass the elation caused by her initial success. There doesn't have to be a grand reason though, these peonies say "I'm thinking of you" like no other. Our products are grown with a tender touch that ensures the best quality delivered straight to you. Not a bloom gets past USA without a thorough assessment of their fine appearance.